pass on. One had an OK ending, one didn’t. Not comforting to think about what these folks endured. But on the inspirational side of these often-tragic tales, I just saw the movie 127 Hours and other than the predictable Hollywood-ization that took place, it’s worth seeing if you like to get out and explore and consider yourself an adventurer, even if just the weekend type. Is it safe for women to hike alone? Are dogs OK on hiking trails? A Buffalo , New York native, I spent half of my life hibernating indoors, but for the past five years I have basked in the thrilling opportunity to enjoy year round hiking on the many trails of beautiful Northern California. In this blog I will continue in the tradition of trailhead, to recap the hikes I have taken and share the insights of my fellow hikers. 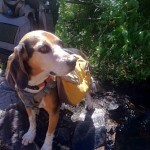 Along with day hikes, I am also interested in dog friendly trails, and backpacking trips as well. Please feel free to offer suggestions of where I should hike next, or share tales of where you have explored. . Guest blog entries are extremely welcome as are your photos from your own hikes.